Mother's Day is just the first of many celebrations that Mom wants to remember this year. There are banquets, dances, graduations, Father's Day, and then that long-awaited summer vacation. A smart phone camera just won't do when it comes to taking picture-perfect photos of all those fleeting spring memories. Best Buy is ready to help with the latest cameras, including DSLR cameras, action camcorders, and compact cameras with long zoom, low light and wi-fi. 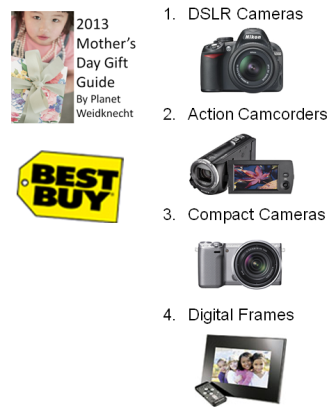 No Mother's Day Gift Guide would be complete without a Mom's Best Buy Wish List! I absolutely LOVE my DSLR camera and my Digital Frame! Head to Best Buy knowing you’ll get the latest technology at the best price with their low price guarantee. If you prefer to shop online, visit bestbuy.com and take advantage of free shipping on all cameras. They even offer a trade-up program where they'll buy your old camera and give you a gift card to use towards your new one. Don't miss the coupon for an additional 25% off select digital photo frames so you can make sure Mom has the best display for her favorite photos and you can tell her you got a great deal (which will make her very proud of you). I love to shop in-store because the staff at Best Buy are always very helpful, but I also love the convenience of shopping at home on my computer. How will YOU make Mom's day this year?